DELIGHTED . . . Cork City manager John Caulfield. Cork City boss, John Caulfield described Friday night’s dramatic 2-1 victory over old foes Derry City as a classic ‘smash and grab’ raid. “It was a bit like a smash and grab for us to come from behind with four minutes to go and win the game,” said the Cork manager. “It proved the tremendous character and fighting spirit we have in this squad, and it’s fair to say, that our second half changes worked a treat. “Derry were defending really well and they had men behind the ball and I felt we weren’t passing the ball quick enough but we still had chances to go ahead in the first half. “Then we conceded a soft goal from a corner just after half-time and that hurt us. It played into their hands because it suited them to play us on the counter attack. “But the changes we made gave us legs on the pitch. I think a comeback like that shows the tremendous spirit we have here this season and we fought to the end. “It was great for Danny Morrissey to get the goal that got us back into the game and we felt in the last five minutes that we might sneak it. It was a dramatic night and the fans lifted the roof off the place when Kenny Browne’s late header crashed into the net. “Kenny Browne got a fantastic header to win it and overall I think it was a fabulous three points and a well deserved win,” he added. Caulfield felt Derry had come to Turner’s Cross intent on leaving with a point. “It looked like Derry came down for the draw and for a long time we weren’t doing enough to break them down but, at the same time, it’s a massive three points. Nine points in a week is huge for us and keeps us right on the heels of Dundalk. “It was a dramatic night and the fans lifted the roof off the place when Kenny Browne’s late header crashed into the net. 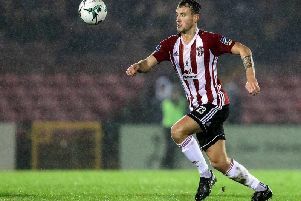 Caulfield sensed a comeback was on the cards as Derry wilted under increasing pressure. “We sensed that we might get an equaliser when we freshened things up, and then when the five minutes added time went up, you could see the momentum. Derry were looking for the final whistle and we were looking for the winner” he concluded.